FeLV+ cats we adopted from the Humane Society of Walden. 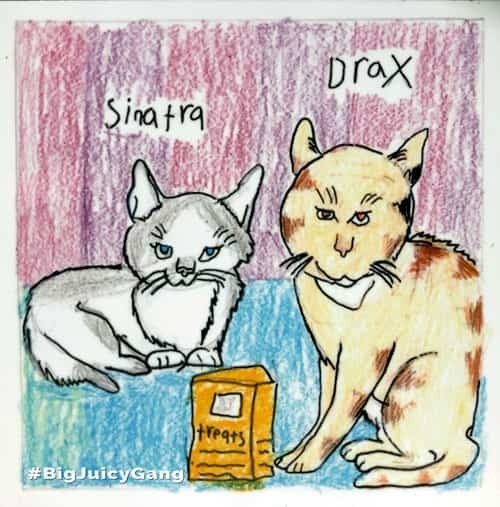 The Big Juicy Gang started on May 21, 2017 when we adopted our first two Feline Leukemia Positive cats, Sinatra (AKA Big Juicy) and Drax the Meower from the Humane Society of Walden. Sinatra, along with a third FeLV+ cat we adopted, Keyser Cöze (Cozy) have since crossed the Rainbow Bridge. The Gang lives on with new members Ruby and Cole. Feline leukemia virus (FeLV) causes a highly contagious and potentially fatal retroviral infection that weakens a cat’s immune system, making them susceptible to illness and secondary infections. However, exposure to the feline leukemia virus doesn’t have to be a death sentence; about 70% of cats who encounter the virus are able to resist infection or eliminate the virus on their own. Cats with FeLV can live until a ripe old age; many infected senior cats pass as a result of problems not associated with their infection. Humane Society of Walden’s FIV+ and FeLV+ cats are some of the most loving, affectionate cats we have ever met – but most of them have been waiting a long time to be adopted, just because people who don’t know any better are afraid of the virus they carry. Please consider adopting one of these wonderful cats! If you meet them, you will fall in love!